Around 1996 Shopsmith Inc. was playing around with a new color combination, which ultimately found its way onto the Shopsmith Scrollsaw as seen in the photo at right. I'm sure my bride could name the exact color, but to my eyes, I'd say it's black and teal. 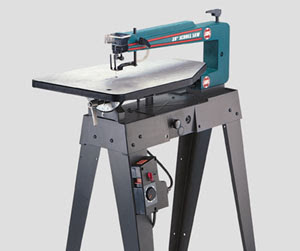 If you know much about the history of the Shopsmith tools you'd know that they've come in several colors including two tone green, smooth gray, two tone gold and textured gray; and up to this point, Shopsmith Inc. had stuck to a textured gray finish on all its tools. I really like this combination and mentioned this during one of my visits to Shopsmith Inc. in Dayton while I was there working on a new franchise store concept. 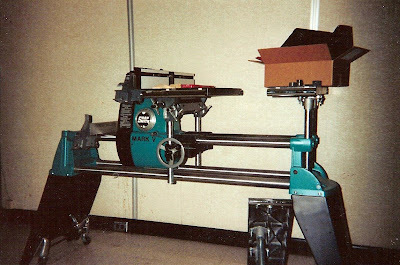 Following one of our meetings, I was asked to take a look at a new "Shopsmith Mark V of Tomorrow" prototype which among several other new ideas featured the same color scheme as the scroll saw. Again, I really like this combination, and if RLFShop makes a go of it I hope they consider using it on at least a promotional version of the Mark V.
A few other neat features they were playing with here was an advanced fence extrusion that had a T-slot on the two faces for quick attachment of axillary fence faces like the split router/shaper fence shown here. This idea made its way to the 520 fence. It also has a flip lock on the headstock, just like the one of the on the 505/510 & 520 carriage. If you've ever seen a used Mark V for sale on eBay with a DIY paint job you'll know why I'd never do this to my Mark V, but I sure wish mine looked this cool.